Poinsettias are a popular favorite around Christmastime. Going to church and seeing red poinsettias with their pots wrapped in shiny green foil makes me feel festive at this time of year. Chances are good that you have a lovely gathering of poinsettias in your home or office already. But have you ever wondered how this distinctive plant became so closely connected with the Christmas season? This week, I took a closer look at the poinsettia and its interesting history, and here’s what I found. Poinsettias are native to Central America. These plants, called “cuetlaxochitl,” meaning “brilliant flower,” were used by ancient Aztecs to make purple dye for clothing and makeup. Also, the sap of a poinsettia was used to treat fevers. In southern Mexico, poinsettias flower for a short amount of time in the winter. In 1828, the U.S. ambassador to Mexico, Joel Poinsett, visited southern Mexico and became enchanted with the poinsettias he saw there. He brought some of the plants back to his greenhouses in South Carolina, and he nurtured his poinsettias and shared them with friends as well as botanical gardens. These plants got their English name from Poinsett. There are many connections between poinsettias and Christmas. For one, the poinsettia plant has a similar shape to the star of Bethlehem. Also, the plant is red and green, which are colors associated with Christmas. In addition, there is a legend about the poinsettia and the birth of Jesus. According to the legend, long ago, a young Mexican girl named Pepita wanted to bring a gift to church to honor the baby Jesus, but she didn’t have anything of value to give. So she picked some roadside weeds and laid them before the altar. Suddenly, the weeds turned into a beautiful bouquet of red flowers. People who witnessed this miracle called them the Flowers of the Holy Night. Do you want your poinsettia to last beyond Christmas? If so, there are some care tips to remember. For one, water your plant only when its soil is dry. Gently stick your finger about an inch down into the soil to make sure it’s dry before watering. Also, keep it in a cool room (about 55 degrees) in the evening so it will bloom longer. With the right care, you can even get your poinsettia to rebloom! Along with using the poinsettia as medicine for fevers, the Aztecs believed the plant had magical propertieslike causing a baby to be born crosswise. Poinsettias grow as shrubs in southern Mexico. They can sometimes grow up to 12 feet tall! Poinsettias are the national emblem of Madagascar. At least $200 million worth of poinsettias are sold each year during the Christmas season. The red petals of a poinsettia are really its leaves, or bracts, while its small yellow bulbs are its flowers. 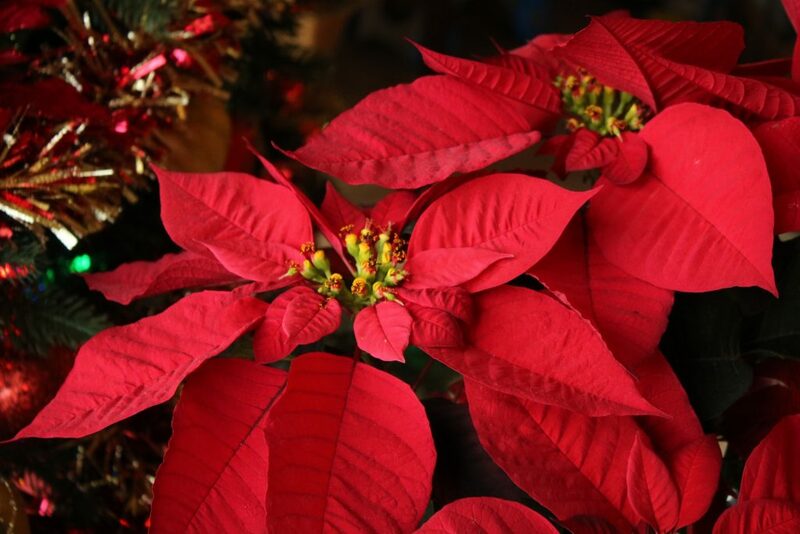 Though the bracts of a poinsettia are not deadly to people or animals, they can make you sick. As you pick up a poinsettia or two for your family this year, remember the story of Pepita and her humble gift. Happy holidays!